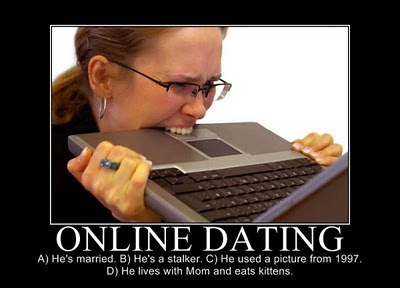 Over the past four years I've been on countless blind dates -- online dating sites, set ups, Twitter -- and a handful of normal ones, you know, where you meet someone in a way that makes you think, If this works out we'll have a great story to tell our grandkids. I came to the conclusion a while ago that the latter way was the best way to go. The problem is, not many of those chance encounters happen, and I can go about three months without going on a date before I start to get reeeeeeeally antsy and the sick and twisted magnetism of eHarmony begins to pull me in like a moth to a flame. Its promises of meeting that perfect match become so enticing that I find myself daydreaming about skipping meals to pay for the membership. This time it'll work, I assure myself. Usually my good sense kicks in and I either find a date on OK Cupid ('cause it's free) or remind myself that long ago I made Joanna promise me she would cut my hands off if I ever signed up on an online dating site again. Reality. I'm fairly certain I've dated all these guys, even the last one. About 15 minutes into it an older man (I mean in his 70s, not older in the sense that I would consider dating him if he had a good job and kids that lived with their mother) approached me and invited me to join his group of South Carolinians living in DC. *Not really his name, but just go with it. 1) The older man was in seersucker and had a Charleston accent. I lived in Charleston for six years as a child, and talking to him evoked feelings of true, genteel Southern hospitality, like the time a man in a pink sport coat called down to my mother and me as we passed his century-old waterfront home and invited us in for a tour. It would be creepy here, but there it was super charming. When I told this man I'd lived on James Island, he said, "Jimmy Isle!" Listening to him talk felt like a home from long ago that I'd forgotten about. 2) Both of the men work in PR, my career field. PR professionals are networkers by trade, but when you meet others in PR you are conditioned to get into hyper-networking mode in case you could help each other out job-wise one day. 3) I realized my accessibility plan was finally working. Why hadn't it worked before? All I had to do was toss my hair and sip a drink, and the guys would come flocking. I was definitely doing this more often. 1) Jack was wearing a wool jacket on a deck by the water in 90-degree heat and high humidity. Now that I think of it, he wasn't sweating, which is kinda weird. 2) He told me he was "between jobs." I wrote it off because I was completely seduced by the idea that I was in the midst of a chance encounter. 3) He is from New Mexico, not South Carolina. He just went to grad school in South Carolina. Imposter! If you're a guy, at this point you're thinking I'm picky. Let me state for the record that I will go out once with just about anyone. But a girl's got to maintain some kind of standards, and when our conversation took a certain direction, I had to draw the line. "You should join the *Anyone Who Has a Vague Connection to South Carolina and Now Lives in DC* club!" The Imposter told me. "Then you must know *So and So*," he said, mentioning a girl I do in fact know. I laughed. How funny that we would find a connection so quickly! "Yes I do know her, she knows everyone. The quintessential networker. I used to work with this super obnoxious guy who claimed he was friends with her, but I think a lot of that was in his head." I described the former coworker and his antics a little more, and The Imposter cocked his head and said, "He sounds a lot like my friend Jack..."
The former coworker's name was Jack. "Jack Taylor?" I asked, mortified. "Yes!" he exclaimed. "He's my best friend. But I can see how he could be annoying to work with." "Well, okay then!" I said, reaching for my melting margarita for momentary escape. 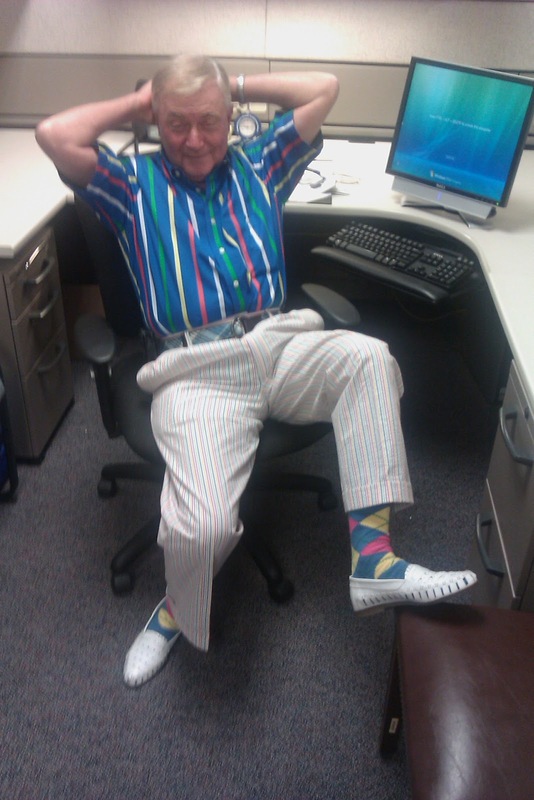 An image of Jack the Obnoxious Coworker in a bright Hawaiian shirt and loafers with no socks and a really chestery mustache he'd been working on for two weeks flashed through my head. Then it hit me -- Jack the Imposter was probably just like Jack the Obnoxious Coworker, thinking he was friends with *So and So* and flaunting it every chance he got. Let me tell you about *So and So* -- she's a gorgeous blonde with a hot body who is personable, articulate, witty, sharp and so fantastic that as a woman you can't hate her even though you want to reeeeally bad. The girl has got it goin' on, and she's super friendly to boot. Not the type of girl who would ever make an awkward guy feel bad about himself if he, say, hit on her at a social event or tried to talk to her via social media channels. But Jack the Imposter didn't look super cheesy like Jack the Obnoxious Coworker, and he was good looking enough -- nothing a good personality, charm and chivalry couldn't make up for. So I decided not to write him off just yet. "Since you know Jack Taylor, maybe you also know Jack Wilson," he went on. Margarita went down my windpipe and I coughed. Jack Wilson was a guy I sort of went out with a couple of times a couple of years ago, but that ended when we were at 18th Street Lounge with a group of friends, I excused myself to go to the ladies room, and he took that opportunity to blatantly hit on another girl. When I came back to the sofa we had all put our jackets on purses on, he was on the dance floor, grinding on the girl right in front of me. I promptly exited the building and heard later that one of the guys with us confronted him and Jack Wilson tried to start a fight with that guy and then was kicked out. Then he had the nerve to text me the next day asking me out again. "Uh, yes, I know Jack Wilson." I said, worried about what was coming next. "We all hang out together all the time," Jack the Imposter explained. "We call ourselves 'The Tri-Jack-Ta.'" That's when I decided to write him off. Call me presumptuous, but if he's BFF with two guys who I can't stand, it's not going to work. I expected him to draw that conclusion when I told him I thought Jack Wilson was a Grade A Jerk, but the Imposter continued to talk about Grade A Jerk and what a great guy he is, emphasizing that he'd changed since he began dating his current girlfriend, who I found out I also happen to know. The girls finally arrived, and we quickly got caught up in our own conversation, so Jack the Imposter walked away. I figured we had a mutual, unspoken understanding about the unfortunate situation. But a few minutes later he walked back over. "Did you text *So and So* and tell her that you met me?" he asked eagerly. "Really? I'll text her that I met you then." This was starting to get awkward. For all I know, *So and So* may be bosom buddies with these guys. But I really, really doubt it, and there was no way I was bugging her with a text exclaiming that I'd just met the third and final point of the Tri-Jack-Ta. About that time I remembered I had dinner plans and had to run, so I said good-bye to everyone and left. I did not exchange numbers, business cards, Twitter handles or blog names with Jack the Imposter. But apparently I gave him my full name, because late last night I received a Facebook friend request from him. Really?! Not only that, but I noticed we have even more mutual friends than what we realized last night. It may be time for me to move to a new city. The dating pool has officially gotten too small. Meet the man who said he would marry me. How could I ever compete with this awesomeness? 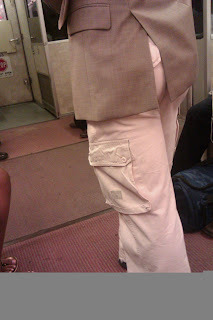 Those pants are seersucker, BTW. "Anyone want to marry me?" I loudly propositioned my entire office. "I'll marry you!" a nearby cubemate answered. I scooted my chair back to see him smiling at me, coffee in hand and mis-matched plaid shirt and striped tie -- not to mention wedding ring -- glaring at me. "Thanks, but you won't work. You're too short." He snickered and asked why I was looking for a husband. "Muscles," I explained. 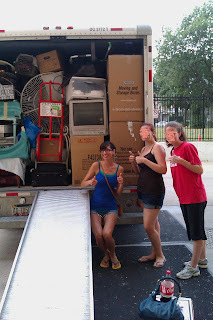 You see, Moving Disaster 2011 was about to be in full swing, and my arms, already tired from simply packing and carrying boxes from trash bins to my apartment, were not going to last much longer. I was quite put out by the whole event because, even though a Cupcakes and Shoes reader hooked me up with an ab fab apartment, there would be a two-day gap between moving out of my old one and into the new one, thus tripling my moving expenses. Essentially I'd be paying for two moves plus two days of storage. My options were: a) Use all my savings; b) Re-rack up credit card debt; or c) Ask for help. The first two options were looking great. As an independent woman, I was NOT going to ask male friends for help. No way. But if I could find a husband in the next few days, now that would be ideal. Boyfriends can get out of these sort of things (the last one was conveniently in Germany when I needed moving help), but husbands are required to help -- nay, lead, direct and execute the entire thing. I usually am not sad about being single, but I was suddenly feeling very, very alone in the world. I was telling all this to my friend Sharon over pedis when I found myself crying. The young girl pounding on my calf muscle stopped and handed me a tissue. *Note to all of you: never cry during a pedicure because the pedicurist will speed through it to get away from you. ﻿"Don't worry, my brother-in-law will help you, and you must have some guy friends who can pitch in," Sharon offered. But somehow (somehow = Sharon's brother-in-law rounded up a couple of guys and a slew of my blogger friends came over and made a party of out of it) more than enough people showed up, and we knocked it out in time and then had a BBQ at A Single Girl's house. Of course there were a few glitches. Glitch No. 1: Picking up the U-Haul. A Single Girl drove me to the U-Haul and dropped me off. She was helping her roommate move a mattress right after, so she couldn't stick around. I walked up to the counter and asked for the truck I had reserved online. "We don't have your reservation," the woman behind the desk told me. "But it's okay, we've got a truck you can use." I sighed and thanked her, and laughed at myself for expecting the worst. "Just need to see your driver's license." I'd just had it renewed -- thank goodness I got that done in time! -- and I was all ready to tell her, "Don't mind the scowl on my photo! I think it's so unfair they won't let you smile anymore," when I realized I didn't have it. And I knew exactly where I'd left it: in my wallet. That's right, I didn't bring my wallet with me. I had two colors of lip gloss but no wallet. I had Tylenol and an emergency migraine pill but no wallet. I even had a credit card...but no wallet. I called A Single Girl -- because I had my phone AND phone charger but no wallet -- and she said she'd come back. So not only did she miss helping her roommate, she had to drive the U-Haul, plus they wouldn't take my credit card without an ID, so she also paid for it. Glitch No. 2: I wasn't finished packing and I had no more boxes. Why why WHY must I wait until the last minute to get stuff done? The Friday before the move I emptied all the paper boxes in the office, and a coworker collected other boxes from other offices in our hallway. I lugged at least 20 of those things (broken down) home on the Metro during rush hour on a Friday, yes I did. I had no idea boxes were so heavy. Or could hold so little. Or maybe I have too much stuff. In the end we were wrapping furniture with my living room throws (picking off pieces of masking tape from Dry Clean Only blankets was a fun little task the following week) and dumping everything else into trash bags. For all I know stuff that was not trash was thrown away in the midst of the chaos, but at this point it's a blessing. I have GOT to downsize. Glitch No. 3: It wouldn't all fit in the U-Haul. Sharon's brother-in-law found me frantically stuffing throw towels into a trash bag and gave me a sickly smile. "Do you have a back-up plan?" "Back-up plan? What? I got the 'One Bedroom Apartment' truck!" I said, feeling faint. "Well, I don't know what to say, but it's almost full and you've still got a lot of stuff." I peeked out in the hallway and my heart sank. I'd been so busy finishing packing that I hadn't paid any attention to the actual moving of the furniture. The long hallway leading to the elevators was lined with boxes, furniture, plastic bins and of course bags. And let's not forget my Pretty Schwinn, which is so pretty. It could not be left behind. So I went downstairs to the truck, for some reason thinking I could fix the problem. That's when I ran into Sassy Marmalade. "Don't worry," she said, seeing the fear in my eyes. "I'm awesome at Tetris." Everything but the bicycle fit, but one of the guys took it apart and shoved it in the front seat. I was so impressed. But we weren't done with glitches yet. Glitch No. 4: It all fit, but the door wouldn't shut. I had to drop off the U-Haul at my new landlord's house where it would sit for two days before I could move into my new apartment (with hired movers, thank goodness), and only Dating DC could drive a stick shift (my car), so she stayed behind while everyone else went home or to the BBQ. Together we hoisted the ramp back into its slot, and then I pulled down the door, but it wouldn't go down all the way. I rolled it back up and rearranged some items we'd stuffed on the top and tried again. No success. Dating DC tried to no avail. We kept at it for at least 10 minutes, and then a man walked toward us, not to help us but to go into the building. I looked lustfully at him -- his man muscles, his man brain, his sheer manliness that would surely be the answer to our problem, as it was the answer to all the world's problems, or so I felt at that moment. Dating DC didn't say anything, but as my mouth opened to pull out the Southern accent secret weapon and ask for his man help, our woman ESP sixth sense thing kicked in, and my mouth shut. I walked back over to the truck, and like magic I noticed the ramp wasn't in all the way, and that's what was causing the door to not shut. "That was a close one," she said, smiling at me. "I really thought you were going to break down and ask him for help." As I drove that big truck down 14th Street, across the bridge and into Del Ray, I felt strong, powerful and capable of overcoming just about anything. I highly recommend driving a U-Haul if you ever get the chance. It's awesome. And so are girlfriends. Back at A Single Girl's house, we chowed down on burgers and drank fruity drinkies, and with the sun setting behind us we all knew we'd accomplished something huge together that day. ...and I'm not even going there because it was so awful. (It included movers peeing on my toilet seat and me throwing out the Comcast guy.) I'd really just like to forget it and remember the nice moments with my helpful friends. The end. For more information on cargo pants, please refer to this classic Bud Light commercial. And guys, for the love of Pete, get rid of your cargos immediately unless you're in the military or a construction worker.